However, after King Wu’s death, Wu Geng fomented a rebellion and was killed by the Duke of Zhou. Another Shang royal family descendant, Weizi (微子), was granted land at Shangqiu (商邱 ‘the hill of Shang’), where the capital of the new State of Song was built. 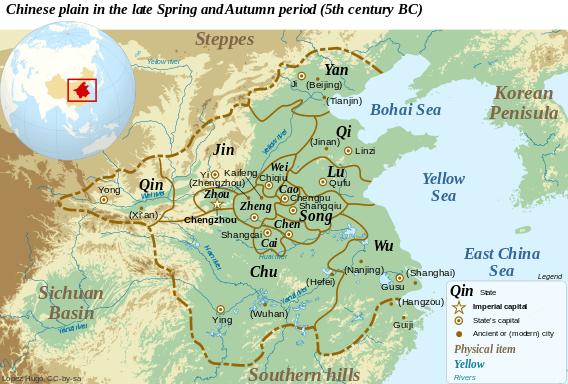 The title of Duke of Song and "Duke Who Continues and Honours the Yin" (殷紹嘉公) were bestowed upon Kong An (孔安 (東漢) by the Eastern Han dynasty because he was part of the Shang dynasty's legacy. This branch of the Confucius family is a separate branch from the line that held the title of Marquis of Fengsheng village and later Duke Yansheng.